“Sewers of the World Unite” in Moscow shows Bobbi’s prints, sculptures, and art happenings under archives. The site also features myriads of manhole cover photos and art by more than 200 artists from over 70 countries. Manhole Artistamps by Alexander Kholopov , Russia "The Best Sewerage for the Best People", 1996, artistamp series. Moscow Artistamp Collection– International Collection of unofficial stamps made by artists including Alexander Kholopov. Manhole Covers, drains, grates – Drainspotting is all about paying attention to your surroundings. Manhole covers, drains, grates, trench covers–someone had to design all of these. Functional and ornamental, there's a lot of interesting stuff happening down by your feet. Manhole Covers.net All models presented here are old french manhole covers. One of the coolest attraction in Japan lies beneath the feet. 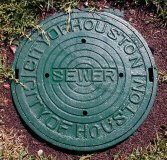 All across the country, manhole covers are custom made for individual towns and cities and they are colorfully painted. The idea for artist-designed hatchcovers (manhole covers) in Seattle came from Seattle Arts Commissioner Jacquetta Blanchett, after seeing hatchcovers in Florence, Italy in the late 1950s. Paul Schell, then director of Seattle's Department of Community Development, also thought it would be a good idea to replace some of the old and battered personnel hatchcovers downtown. Unique NYC Manhole Cover Installations by Michele Brody.- Re-Covering the Cityscape:Impressions of History Underfoot is a public art project that investigates, celebrates, and commemorates particular elements of lost New York City through the installation of a series of uniquely cast manhole covers. Reused traffic signs fashioned into chairs, tables, wall pieces and artifacts. "Bleached Metal After a Downpour"
Wall Art (amazing rhythms, patterns and textures). A fascinating collection of world wide manhole covers and manhole artistry. Bobbi Mastrangelo and several of her works are included. Bing Search Images of Bobbi Mastrangelo and her art etc. Briscover – The Leader for FRP/GRP manhole covers and composite manhole covers in China. (Earth Day is Every Day). Creating the Hazardous Waste Site for “Outdoor Sculpture Now” at Islip Art Museum. Bobbi Mastrangelo’s Environmental Manhole Art educates people of all ages all over the globe. American Water Works Association (AWWA) is an international nonprofit scientific and educational society dedicated to the improvement of drinking water quality and supply. Part Two (Earth Day is Every Day). Keep America Beautiful is a national nonprofit public education organization dedicated since 1953 to engaging individuals to take great responsibility for improving their local community environments. Keep Polk County Beautiful – Created in 1994 and certified by Keep America Beautiful, Inc. in 1996, this non-profit organization works with civic, business, government, educational and community groups across the county to improve the aesthetic and ecological value of our communities through litter control and prevention, beautification, waste reduction, recycling and proper handling and disposal of solid waste. Electronics & Appliances Recycling at Best Buy RECYCLING MADE EASY We will take all kinds of used tech,1 no matter where you bought it or how old it is. World Bank Water Supply and Sanitation Because water is so essential to life, the World Bank Group strives to help its member countries ensure that everyone has access to efficient, responsive and sustainable water and sanitation services. Water Conservation, Energy Conservation and Cleaning Supplies). In today's modern, industrialized world, people have become a greater threat to our oceans, rainforests, and other natural habitats more than ever before. Pollution, waste, garbage, overdevelopment, and other issues have become a real issue for our environment. Our ultimate guide to the overwhelmingly large amount of effects of smoking. Exciting new advances in recycling technology now allow many kinds of plastic packaging to be recycled right here in Canada. Over the past fifteen years, Jon Schladweiler, the Historian of the Arizona Water & Pollution Control Association, has researched and collected materials related to the history of sewage conveyance systems. Roberta Bird Fabiano – Musician: Guitarist, Songwriter, Singer, Artist (Music and Bird Themes). Artists Registry – We are a community of Visual Artists and organizations. We connect artists together with galleries, museums and arts organizations and place member's artwork before the eyes of thousands of art collectors. Art & Science Collaborations, Inc. Founded in 1988, Art & Science Collaborations, Inc. (ASCI) is one of the few art & technology *members* organizations in the USA. The Friends of Dard Hunter, Inc. An international group dedicated to the study, use, creation and appreciation of handmade paper. National Association of Women Artists – N.A.W.A. was founded in 1889 by five women who wished to create an artistic community of their peers and wider opportunities to exhibit their art. Osceola Center for the Arts – Its mission is to promote, cultivate and foster interest and participation in the Arts by providing affordable and accessible programs and facilities that encourage artistic expression in the diverse community we serve. Smithtown Township Arts Council (STAC) is a multi-arts organization serving the cultural needs of the community and surrounding regions. Established in 1972, STAC offers professional year-round gallery exhibitions and group thematic shows. Webists are active artists with enthusiasm for peace and understanding. The Heckscher Museum of Art collects and exhibits European and American paintings, sculpture and works on paper from the 15th through the 20th centuries with an emphasis on 19th and 20th century American landscape painting and American Modernmism. Islip Art Museum is the leading exhibition space for contemporary art on Long Island. NYC Fire Museum The Museum houses one of the nation's most important collections of fire related art and artifacts from the late 18th century to the present. Here’s an a-cappella quartet that “bursts” with energy and entertainment value! Affordable Art – A wide range of features that makes the art fair, the great place where you can meet up with your friends or bring your family together. Artodisha.com is the place of original and contemporary art that fit in all budgets. ART TIMES, est. 1984, the “go to” source for creatives and those who appreciate good writings, is published quarterly in print and arttimesjournal online is updated monthly.